A new analysis from investment bank J.P. Morgan says Windows-based ultrabooks are unlikely to achieve similar success as Apple's MacBook Air in their first generation and will not become "meaningful enough" to drive growth in the notebook PC market until at least 2013. Analyst Mike Moskowitz issued a "Quick Thoughts" note to investors on Tuesday calling ultrabooks "just more of the same in PCs." He viewed the new category of laptops as drawing heavily on Apple's design cues from the MacBook Air, which first arrived in 2008. "It seems that everyone wants to be like Apple," he said. "All of this market emulation of Apple is ironic, in our view, given the initial skepticism that the MacBook Air received." Intel introduced the ultrabook design specification last May at the Computex trade show. The chipmaker set an optimistic goal of reaching a 40 percent share of the consumer laptop market by the end of this year. The analyst voiced skepticism that Intel will manage to reach that goal. He did, however, point out that, technically, the MacBook Air meets the requirements for an ultrabook. "Given the MacBook Airs success, this dynamic may be leading to Intels somewhat optimistic view of the Ultrabook adoption rate," he wrote. The major obstacles that Moskowitz sees for ultrabooks in the near- to mid-term are price points, lengthening PC replacement cycles and increased competition from smartphones and tablets for IT dollars. According to him, customers who pass up the MacBook Air will be looking for "meaningful discounts" on Windows-based ultrabooks. Those discounts, however, appear to have been deferred until the next generation of ultrabooks arrive late this year and in 2013. Taiwan's DigiTimes reported on Tuesday that ultrabook prices will likely drop 20 to 30 percent in early March to April ahead of the release of Intel's next-generation Ivy Bridge platform in April. On a slightly positive note, the analyst's research indicated that PC makers have not built up a large stockpile so the likelihood of a "supply chain bubble" is low. Reports from late last year suggested that ultrabook makers were slashing production of the devices after early sales proved "unsatisfactory." Moskowitz attributed some of the decline in PC sales to a focus by vendors on price takedowns rather than technology advancements. Apple, however, bucked the trend by continuing to innovate "with an acute focus on the user experience, targeting both feature and form factor differentiation," the analyst noted. "Given this market disparity, we believe that Intel is trying to breathe new life into the PC industry by adopting a page from Apples playbook: push a feature-rich, easy-to-use mobile product family that competes on more than just price," he said. However, J.P. Morgan is doubtful that Intel's efforts will take. Moskowitz characterized Apple's MacBook Air as a one-of-a-kind success story that was highly unlikely to transfer to ultrabooks. "We do not believe Ultrabooks can jumpstart the growth trajectory of the notebook PC market in 2012," he said. 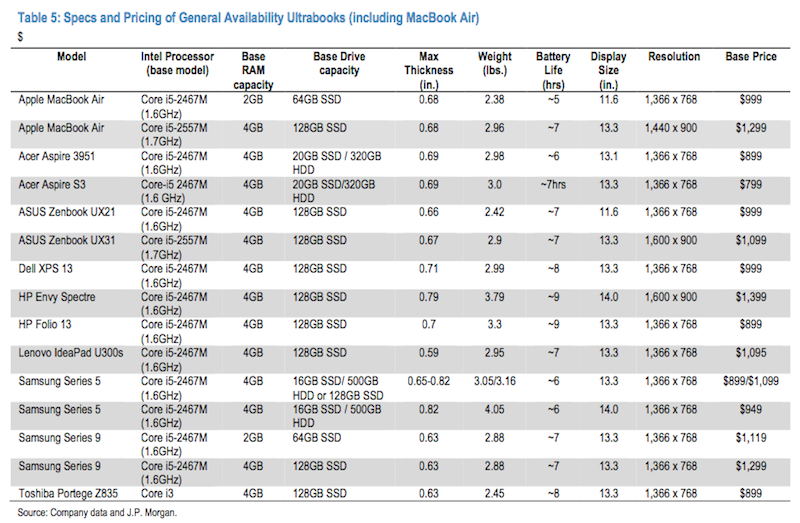 "The MacBook Air form factor has been a success for Apple, but we are skeptical that similar success can be replicated by Windows-based Ultrabooks in the first generation." The analyst went on to compare the 2012 ultrabook situation to last year's tablet push: "a lot of sell-in from Apple look- alikes but with little sell through." 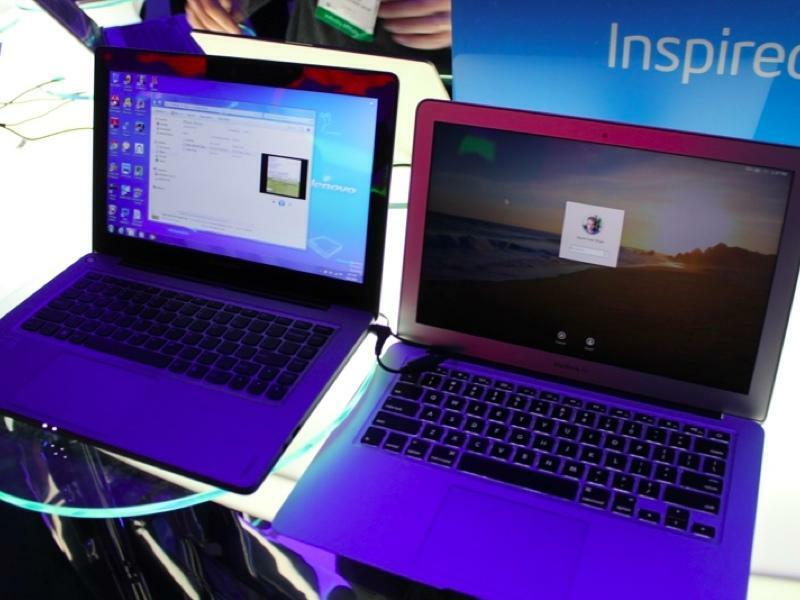 Intel reportedly expects more than 75 different ultrabooks to be introduced this year. In Moskowitz's view, the high number of unique, but barely differentiated, models could "overwhelm or confuse potential customers." Moskowitz noted that the MacBook Air saw a 69.3 percent three-year compound annual growth rate through the third quarter of 2011. By comparison, the total notebook PC market had a CAGR of 15.8 percent during the same period. Apple's MacBook Air achieved impressive sales growth after the company slashed the price and introduced an 11-inch model in 2010. An update last July added the Thunderbolt I/O and a significant boost in speed by way of Intel's Sandy Bridge CPUs. According to one estimate, the thin-and-light notebook made up 28 percent of Apple's notebook sales last October, compared to just 8 percent in June 2011. The analyst said he doesn't see ultrabooks posing much of a threat to the MacBook Air until their pricing falls below $800 since Apple has the benefit of first-mover advantage, optimized feature set and form factor. He expects the number of ultrabook models to "double or triple" in the second half of 2012 and simultaneously dismissed the new laptops as "noise" that will not affect the MacBook Air's "accelerating growth dynamics."